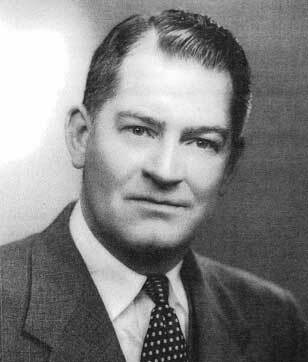 William O. Ware was elected Grand Junior Warden of the Grand Lodge of Kentucky, F. & A. M. on October 20, 1954. He was subsequently elected Grand Master of the Grand Lodge of Kentucky on October 16, 1957. He was installed as Grand Master by his father, Most Worshipful Past Grand Master Orie S. Ware (Grand Master of the Grand Lodge of Kentucky 1913-14). William O. Ware was born at Covington, Kentucky on September 25, 1908. His parents were Orie S. Ware and Louise Culbertson Ware. Most Worshipful Bro. William O. Ware was a great student of Freemasonry and a prominent exponent of all forms of Masonic teachings and principles. Volumes from his personal library of Masonic history and literature formed the basis of what is now the Covington Scottish Rite Library. In recognition of his erudition and memorializing his unwavering commitment to scholarly research and writing, William O. Ware Lodge of Research was named in his honor. Young Will Ware attended Holmes High School in Covington, where he graduated in the class of 1926. He received an A. B. Degree from Centre College in Danville, Kentucky, in 1929 and an LLB from the University of Cincinnati College of Law in 1932. Following his admission to the bar, William O. Ware served on the legal staff of the Reconstruction Finance Corporation in Washington, D. C. and on the staff of the Kentucky Court of Appeals in Frankfort, Kentucky (at that time the only appellate court in Kentucky). In 1937 he entered the practice of law with his father, Orie S. Ware. In 1942, his brother, James Ware, joined the firm. William O. Ware married Eleanor Briggs on November 26, 1938. Their union was blessed by three daughters, Patricia, Katherine and Ann. Bro. Ware was initiated an Entered Apprentice Mason on February 26, 1940 in Covington Lodge No. 109, Covington, Kentucky. He was passed to the Degree of a Fellow Craft on March 25, 1940 and raised to the sublime Degree of a Master Mason on May 11, 1940. Bro. Ware was raised a Master Mason by his father, Most Worshipful Past Grand Master Orie S. Ware. Worshipful Bro. Ware served as Master of Covington Lodge No. 109 in 1952. Most Worshipful Bro. Ware was a member of Indra Consistory, Covington, Kentucky, Ancient and Accepted Scottish Rite. He was made a Knight Commander, Court of Honor in 1951 and was coroneted an Inspector General Honorary (33°) on October 23, 1959. He also held memberships in Covington Chapter No. 35, Royal Arch Masons, Kenton Council No. 13, Royal and Select Masters and Covington Commandery No. 7, Knights Templar. His York Rite honors included the York Cross of Honor, the Order of the High Priesthood and the Order of the Silver Trowel. He was a member of Syrian Shrine Temple, A. A. N. O. M. S., Cincinnati, Ohio, Kishmee Grotto, Covington, Kentucky, White Shrine of Jerusalem, Covington, Kentucky and Rosebud Chapter, Order of the Eastern Star, Covington, Kentucky. In addition to his Masonic service, Most Worshipful Bro. Ware served as Chairman of the Board of Directors of the Covington, Kenton County, Boone County Chamber of Commerce. He was a member of the Board of Directors of the Daniel Beard Council, Boys Scouts of America. He belonged to the Covington Rotary Club and was a member of Trinity Episcopal Church in Covington. Bro. Ellis’s remarks echo those of M. W. P. G. M. Carroll M. Curtis, who recalls that on occasions when M. W. Bro. Ware was in the offices of the Grand Lodge of Kentucky, he spent most of his time in the Grand Lodge’s library. William O. Ware’s towering legacy as a man of integrity, intellect and devotion to Freemasonry lives on after him.